Scottish Secretary Michael Moore has said there is no good reason why the Scottish people should have to wait nearly three years to have their say on Scotland's future. Scottish Secretary Michael Moore has said there is no good reason why the Scottish people should have to wait nearly three years to have their say on Scotland’s future. Mr Moore today produced a referendum timetable that would meet all the legal and procedural requirements and still allow Scots to vote on independence in September 2013 - a full year earlier than the Scottish Government are currently proposing. 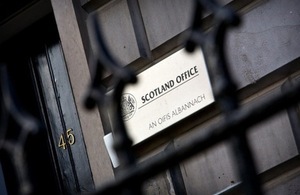 The Scottish Secretary said the “go slow” approach of the Scottish Government is unnecessary and lacks public support. In 2009 the Scottish Government’s proposed legislating for and holding the referendum in less than a year. But Mr Moore said that now that there is a real prospect of the referendum taking place, they want to “kick the referendum can down the road”. “No one has yet explained to me why the people of Scotland should have to wait nearly three years to make the most important decision we will ever make. It is not in the interests of the Scottish people to build up uncertainty and make them wait. “The timetable I have produced today shows there is no good reason for the Scottish Government’s go slow approach. We can follow all the proper procedures and parliamentary processes and still have a referendum in September 2013. “Recent polls have certainly indicated that people think we should get on with the referendum and hold it sooner than 2014. That certainly makes sense to me. “The Scottish Government outlined plans in 2009 where they proposed consulting, drafting a Bill, legislating and holding a referendum all within 12 months. But now, for reasons of their own, they want to kick the referendum can down the road. “The timetable the Scottish Government have set out has heel dragging built into it. There are months and months set aside for straight forward tasks. Their consultation finishes in May and they then propose taking the whole summer to analyse responses and then the rest of the year to amend their draft Bill accordingly. That could be done properly in a much shorter time frame. “The Scotland Bill will see us transfer the largest ever package of financial powers to the Scottish Parliament over the next four years. Powers over borrowing, income tax and property tax will all transfer to Holyrood. “Before we can move further powers to Edinburgh we need to know if Scotland is to remain part of the UK. That is entirely logical. We should settle the independence question as early as we can.